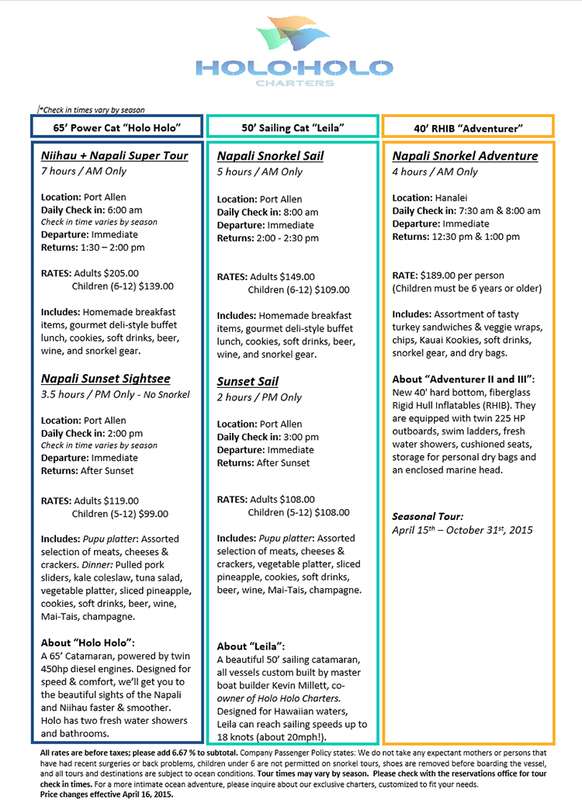 The Ultimate Kauai Sailing Charter Adventure! Understanding the demand for truly world class touring vessels on Kauai, Kevin and Marcie Millet have created HoloHolo Charters Inc. In 1988 the Milletts sailed from the West Coast to Maui where Kevin was hired to build the Trilogy III. By 1990 they moved to Kauai where they established, "Multis by Millett" a boat building business. Millet is recognized as one of Hawaii's premier multi-hull designer builders. By 1997 Kevin saw the opportunity to design and build his own boat. With this extraordinary vessel the Millets established HoloHolo Charters Inc., offering visitors and locals exciting tours along Kauai's coastline and beyond. "HoloHolo" is a "state of the art" 65-foot motor powered catamaran designed specifically for Kauai's ocean conditions with safety, comfort and efficiency in mind. Certified for 65 passengers, only 49 are carried daily. HoloHolo has a full service galley and bar, two large marine lavatories, fresh water showers, and a large cabin. Outside there are two oversized trampolines and seating in the front and back of the vessel. HoloHolo has two 450 horsepower Cummins diesel engines for cruising speeds at 20 knots with top speeds up to 30 knots. "Leila" is a beautiful, 50-foot modern design sailing catamaran with plenty of room on board. She is certified for 45 passengers although we only take 37. Leila has two oversized trampolines, "user-friendly" swim steps or a slide for easy access to the water for snorkeling and swimming. A fresh water shower and two large marine lavatories are also available for your comfort. Her hull design and 60-foot mast increase performance for fast trade wind sailing in Hawaii. HoloHolo Charters Inc. is "Earth friendly" by using natural products and recycling. We hope that you will find the time to experience one of our ocean adventures so that you can see for yourself why people say, "This was the highlight of our vacation." Come HoloHolo with us!